Arthri Aid Omega Gel for Cats is an oral gel formulated especially for cats. It contains Glucosamine, Chondroitin, MSM, vitamin C and manganese that speed up the manufacture of new cartilage and synovial fluid leading to joint mobility. 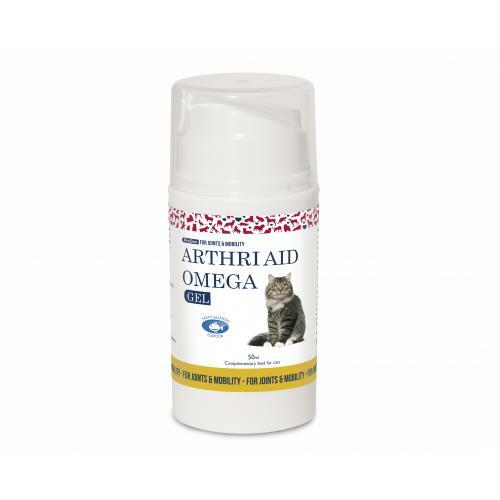 ArthriAid Omega Gel for Cats is a supplement that supplies the necessary building blocks to help the body's own natural manufacture of cartilage. Glucosamine - an amino sugar which stimulates production of new cartilage. Chondroitin - a major structural component of the connective tissue in cartilage, tendons, ligaments and even bones. A major function of chondroitin is to attract fluid into cartilage molecules, which is essential to absorb shock, and to nourish and lubricate the joints. Omega 3 Fatty Acids - Helps decrease the breakdown of cartilage, lubricate joints and assists mobility..
MSM - A natural sulphur compound which helps soothe tired joints and aid mobility. Vitamins C and E - Powerful antioxidants. The gel can be applied to the back of the paw which the cat will then lick off. For cats up to 11lbs (5kg) give 2ml daily. For cats over 11-22lbs (5-10kg) give 4ml daily. After 3 - 4 weeks the daily intake can be reduced by half. For cats up to 11lbs (5kg) give 2ml daily. For cats over 11-22lbs (5-10kg) give 4ml daily. After 3 - 4 weeks the daily intake can be reduced by half. So if your cat weighs up to 11lbs and you feed it the initial dose daily for 3 weeks (21 days), this will last 29 days. If your cat weighs over 11lbs and you feed it the initial dose daily for 3 weeks (21 days), this will last 13 days.